to love, serve and honor one another. Note: This sermon was inspired by a song by Jason Shelton, which I simply could not get out of my head one week. The link to a youtube video teaching the song is at the bottom of the post. Once upon a time, there were two brothers. We will call them Cain and Abel. Abel, the younger brother, was a shepherd. Cain, the older brother, was a farmer. And they worshipped a deity who was anything but a vegetarian. So their God loved the sheep sacrifices that Abel brought, but was not too fond of the veggies Cain provided. In this story, God sounds a little like a fussy toddler to me, but that is besides the point. I am sure there were some good reasons back in the day that have gotten lost over the ages. What is the point is that Cain was jealous. His younger brother got all this love and attention from God for his lousy animal sacrifice, while Cain was reprimanded for providing the fruits of his harvest. But rather than take his anger to God, because this God was like an all-powerful toddler after all, Cain took his anger out on Abel, and he killed him. Which was really extreme, and a terrible decision, but that is what he did. Now, God could tell by Cain’s attitude that something bad had happened, and so he cried out “What have you done?” and then God proceeded to curse Cain so that his fields would never yield again. Ahh, the story of Cain and Abel. The first brothers in the Hebrew Scriptures. The first murder. And so much more. Now, God doesn’t really answer Cain’s question in the story – Cain’s question about “Am I my brother’s keeper?” But as God matures throughout the Hebrew & Christian scriptures, that question does get answered, again and again.As Kelli Trujillo writes in her article on this topic: “From laws about caring for strangers and aliens…to strident calls for justice for the vulnerable …to Jesus’ challenge to love our neighbors—even our enemies—as we love ourselves…to Paul’s teachings about hospitality…to John’s vision of the just, peaceful kingdom of God come to earth…the answer is yes, yes, yes” we are, indeed, called to be our brother’s keeper. In many ways, this attitude of love is reflected in the golden rule: Treat others the way you would like to be treated yourself. This ethic of reciprocity is a moral maxim or principle of altruism found in many human cultures and in most of the worlds religions. I know Rev. Elwood Sturtevant of Thomas Jefferson Unitarian Church talked to you about the Golden Rule a few weeks ago. Or let’s take a non-food related example. If a friend of mine experiences the death of a loved one, I might think “Oh, wow, if I were in her place, I don’t think I would want to talk about it.” Utilizing the golden rule, when we get together, I won’t say anything, not wanting to make her feel bad. But what if my friend is the opposite of me, and really does want to talk about it? Utilizing the platinum rule, I would first ask her “Do you like to talk about your loved one?” in order to make space for her to either accept, or decline my invitation based on her preference, not my own. In the long run, practicing the golden rule and distinctly avoiding the topic of her loved one may well stress our relationship beyond what it can handle, whereas if I make space for her to share what her preference is, it allows her to feel how much I love and care about her. Practicing the platinum rule is one way that we can love one another – not by assuming that others are just like us, but by realizing each person has their own distinct story, and their own distinct needs. And then treating them accordingly, because we are all connected and what benefits our neighbors benefits us as well. There is a debate over whether the golden rule, or altruism, is something that is learned behavior, or if it is something that is genetically hardwired into us. Recent studies indicate the answer is both. Let that sit for a moment – we are genetically hardwired, biologically, to want to be helpful to others, to want to be of use, to serve one another. No wonder it is found across the worlds religions! God showed the curious person two doors. 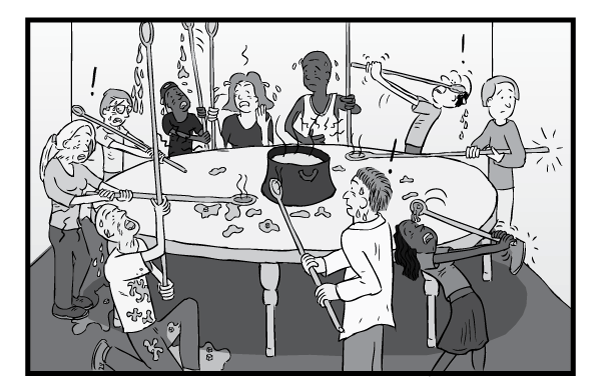 Inside the first one, in the middle of the room, was a large round table with a large pot of stew. It smelled delicious and made the person’s mouth water, but the people sitting around the table were thin and sickly. They appeared to be famished. Everyone was holding a spoon with a very long handle. And though each found it possible to reach into the pot of stew and take a spoonful, because the handles were longer than their arms, they could not get the spoons back into their mouths. Behind the second door, the room appeared exactly the same. 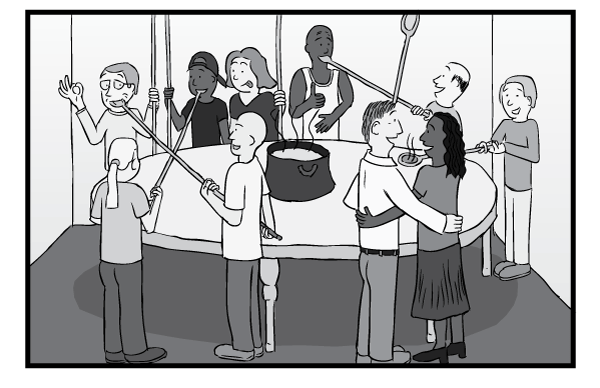 There was the large round table with the large pot of wonderful stew that made the curious person’s mouth water. The people had the same long-handled spoons, but they were well nourished and plump, laughing and talking.The curious person saw that, rather than each trying to feed themselves, they were feeding one another. Heaven and hell – exactly the same. What makes it different is our attitude – it depends on whether or not we decide to serve one another. Of course, this version of heaven never would have worked if each person were not only serving one another, but receiving that which was given to them. I think this aspect of the story gets left out too often: sometimes we need help. Being vulnerable, and allowing someone else to meet our needs, can be difficult. We may not like what is being offered. We may be afraid we don’t deserve their help. We may feel embarrassed, that somehow we have failed to be self-sufficient; that we are not good enough; that we didn’t try hard enough. But think for a moment how good it feels when we are able to meet someone else’s need. Isn’t it its own form of blessing to give someone else the experience of being useful? What we miss when we focus on serving one another is that giving and receiving are two sides to the same coin. When we receive with gratitude and grace, we allow someone else to experience the joy of being of use. We honor their need to serve. And this is how we love the hell out of the world: by loving, serving, and honoring one another. We love, serve, and honor one another by taking care of each other’s needs, making sure they are fed, and knowing that in the process, we will be fed as well. We love, serve, and honor one another by practicing the platinum rule to treat others they way they want to be treated, and by giving others the opportunity to serve us in return. And we love, serve and honor one another by knowing that we are called – by God or by the Interdependent web of all existence of which we are a part, to care for one another and to be each others’ keeper. May we find the strength, curiosity, courage, and wisdom to practice this in our own lives, by learning to give generously and to graciously receive that which is lovingly given to us by others. ministry & the seven year itch. 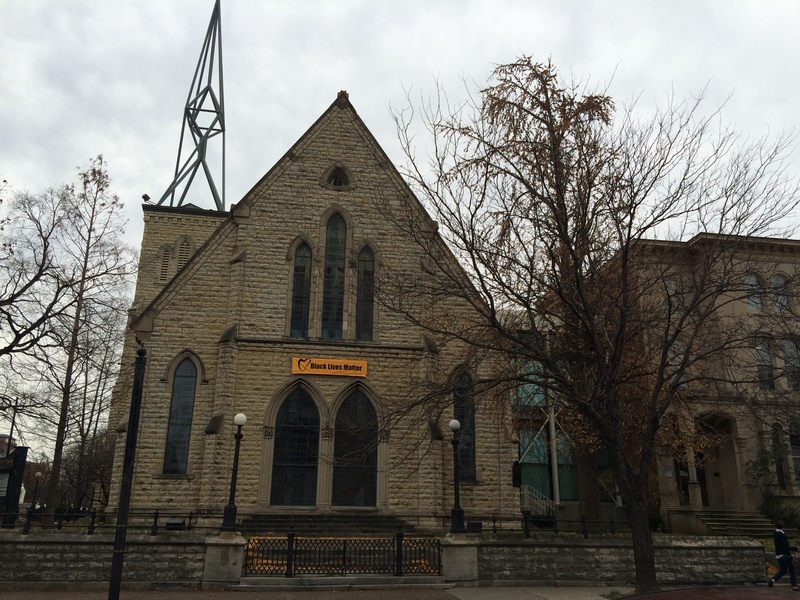 A sermon delivered at First Unitarian Church, Louisville, KY on January 31, 2016. Though it normally takes about 3-4 year to complete seminary, it took me seven. I was on the turtle track – I worked full time through most of it, which, though it gave me the advantage of not graduating with any debt, meant I only took a few classes at a time. We also moved halfway across the country (from Virginia to Minnesota), and had two kids. Seven years. John and my family of origin were stunned. They knew this call to ministry must be the real deal because I had never stuck with anything for seven years. Heck, I hadn’t stuck with much of anything for even 5 years. Most of my previous professional employment had been during the 90s tech boom, when it wasn’t uncommon for people to change jobs every year or two. But really, my history of being someone who samples but doesn’t dig deep goes back to my childhood. While my brother grew up playing soccer and swimming on the swim team, through childhood and college I tried t-ball, swim team, soccer, horseback riding, softball, field hockey, rugby, karate, archery, racquetball, modern dance and I think I am forgetting a few. So when I stuck with seminary for 7 years, my family knew I must have found my calling. And so it is with a sense of awe and wonder that I realize that I am over halfway through my seventh year of ministry with you. Whoa! That was fast! It is hard to believe we are close to completing seven years together. I keep counting it in my head, and on my fingers, just to be sure. But math doesn’t lie: It is indeed seven years. I remember January of 2009, both as if it were yesterday and as if it were a lifetime ago. After exchanging packets of information with the search committee here, and after a couple of telephone calls, I had my first real-life experience with First Unitarian Church in what is called a pre-candidating weekend. I met the search committee, answered a lot of their questions, and they answered a lot of mine. We ate together and laughed together. And you’ll not be surprised to hear there were even a few tears. I preached that weekend at the church in Bloomington, Indiana. We had a great conversation after the church service at a Turkish restaurant where the search committee learned that one of the biggest controversies at the church was something I had written my seminary thesis on! It was quite a kismet moment. I remember the first time I walked into this building. Though I thought the main door was in an odd place, I immediately was in love. This sanctuary is truly a sacred, spiritual place. And the rest of the building is a wonderful blend of old and new. I loved that the Religious Exploration space wasn’t hidden away in the basement! 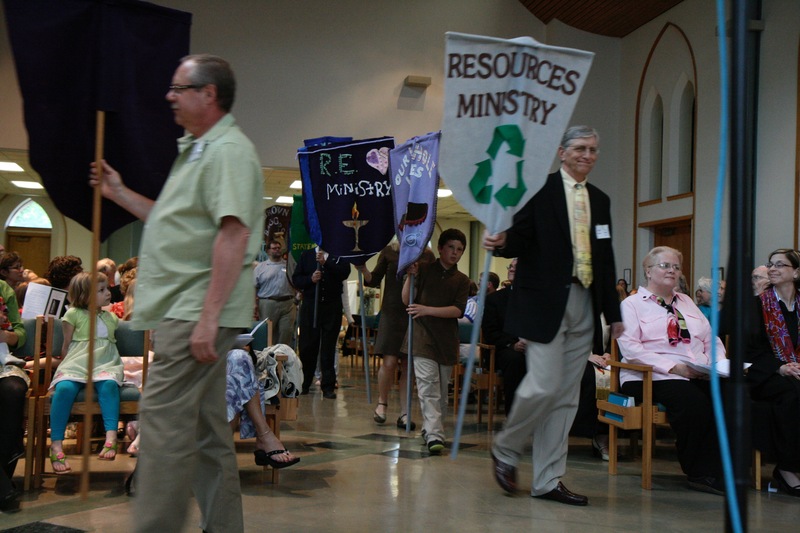 The banner parade during my installation as minister of First Unitarian Church. Before the end of the weekend, I had a strong feeling that you all were “the one.” I saw you as an amazingly resilient congregation that was feeling really down on itself after years of controversy. You were so earnest in claiming your faults that it was hard for you to see the many, many gifts the congregation offers. So it was that over the course of that weekend, seven years ago, I began to fall in love with this congregation. In our tradition, it is the gathered congregation, the covenanted community, that decides whom a congregation calls as your minister. There is no higher authority that dictates it. As a congregation, your job is to find a minister whose gifts match your needs. The minister, likewise, looks for a congregation whose needs match their gifts and whose challenges they find engaging. Though you didn’t necessarily say it outright, early on I got the sense that you were looking for a minister to love you enough to remind you that you are, indeed, lovable. Someone who would see the beauty in the cracks that came from use and endurance, and would celebrate them. This, I knew, was something I could do. And your challenges were ones I felt I could sink my teeth into, that would engage me for many years. When you asked me to be your candidate, I was thrilled. And after 10 days of immersion with the congregation in April 2009, when you voted to call me as your minister, I could not have been happier to accept. But no successful, transformative, healthy ministry is a one-person show. For congregation and minister to form a partnership that is strong and enduring, we must all put in the effort it takes to build up the relationship. The Rev. Jack Mendelsohn once wrote: “The future of the liberal church is almost totally dependent on these two factors: great congregations (whether large or small) and effective, dedicated ministers. The strangest feature of their relationship is that they create one another.” They create one another in the relationship that exists between them, a relationship built on trust, love, challenge, growth and celebration. This is a great congregation. And I am an effective, dedicated minister. And we are creating one another in beautiful and magnificent ways. And in the process, our relationship has grown and deepened over time. We’ve had our challenges. The first year I was here we had to cut the budget by over $100,000. This meant the elimination of several staff positions and the entire ministry council budget. In fact, those of you who were there may recall that we came into the annual meeting $20k short of funding my position full-time – I would have to go to 3/4 time if you couldn’t come up with the difference. My first year. But you did. We’ve struggled financially ever since then, but we are more fiscally responsible, and we’ve grown back some of those staff positions, at Fair Compensation level. We have funded our Ministry Council again, not just through the collection plate like we had to for several years, but as a part of the annual budget. Last year’s pledges were the highest yet – over 22% higher than they were when I arrived! Though I have yet to receive either a raise or even a cost of living adjustment, my position is no longer in jeopardy of being reduced due to financial concerns and the staff are all paid equitably. Beyond the financial, we’ve struggled to figure out what it means to do church in the 21st century. We’ve struggled as we have learned how to enforce healthy boundaries and be a safe congregation. We’ve argued, respectfully and lovingly, about both the sacred and the prophetic. And, I think, we come out of these conversations with a newer appreciation for one another. I know I feel appreciated by you. I hope you feel appreciated by me. But the challenges are far outweighed by the privilege I have experienced being your minister. You have inspired me to grow into my best self – allowing me to be authentic and vulnerable at the same time. Where else would I have been able to bring my roller derby team in to skate, during worship! You encourage me to be a whole person, to balance my work and family life, to take a prophetic voice in the community, and so much more. In these 7 years, we have gotten to know each other. We’ve celebrated when children are born or graduate from high school. We’ve mourned together when someone beloved dies. I’ve been called out in the middle of the night to be there for you in emergencies, and when my family has had struggles, you’ve given me time to focus on being there for them. We know each other well enough to know that none of us are perfect – I have made mistakes, as have you. But through it all, we continue in relationship. There are not many congregations like this one. Speaking with a colleague the other day, I was griping about something probably inconsequencial, and he asked what I celebrated about the congregation. When I began listing all the amazing stuff we have done and are doing, I saw his jaw drop deeper and deeper. “Wow!” he said “That sounds like an AMAZING congregation!” You got that right, I told him. I wish there were more congregations that support their minister like this one does. I wish there were more congregations that were willing to try new things, like this one is. I wish there were more congregations that rise above conflict to do the right thing, even when it is HARD, the way this one does. I wish there were more congregations who put both their money, and their bodies, where their mouth is, like this one does. And I truly wish there were more congregations that have a culture of mutual respect, support and collaboration like this one does between lay volunteers, professional staff, and the ministry team. All these things we have done together – the successes and the failures – have grown me as a minister. You’ve supported me when I have participate in professional development, and when I have taken leadership roles among both my colleagues and now as a Board member for our MidAmerica Region. I am a mentor for other ministers, and leading a new Right Relations team at our MidAmerica Regional Conference in April. I am preaching at a colleagues ordination at the beginning of June and am leading Opening Worship at our General Assembly in Columbus, Ohio later that month. And more. And all the accolades that I get come straight back to you because remember, great congregations and effective, dedicated ministers create one another. I am who I am as a minister and as a leader because of how you have nurtured me and allowed me to minister to you, and encouraged me to minister to the larger community, both UU and local. And now you are starting to get the national recognition that I believe you deserve, as well. So seven years in, I am still totally in love with you. Not a honeymoon kind of love – I know way too much about how the sausage is made for it to be that. No, this is a love that is well aware of and accepts imperfections, while at the same time urging constant growth. The search committee did a wonderful job: we are a great match, and we love and respect, and even admire, one another. These seven years have been incredible. In learning about successful long-tenure ministries, I discovered that every 7 years or so, the minister and congregation must re-invent themselves. So a minister who has stayed at one congregation for 20 years has not been the same minister all those years, and neither has the congregation. In fact, they have each had 2 or 3 different incarnations or phases. I know that I am entering the next stage of my ministry with you, and I want to share what I think it will look like. The first 7-year phase I suspect we will look back on as the trust and confidence-building stage. We got to know each other, built our relationship, and we loved each other until we began to appreciate our gifts and share them more freely. This next phase, I suspect, will be the going-deeper phase. Our trust and faith in one another will be put to the test. We will be trying a lot of new things together. We have to. You have heard me preach about how church is changing – how the structures and mechanisms that were useful in the 1950s are no longer working today. We have to figure out what church looks like in the 21st century. Truly, we must either thrive, or consign ourselves to dying. There are dying churches all around us as evidence. But to thrive, we must try new things. Things that might make us uncomfortable. Things that will, some of them, fail. So we’ll have to pick ourselves up and dust each other off and then try the next thing. Sometimes, I might hurt you. And sometimes, you might hurt me. And then we will come back together again in love and respect and admiration, and we will try again because we trust each other – a trust that took all these years, and all these ups and downs to build. Some of you may observe that we’ve already started taking risks, and that is definitely true. And, I would assert that this risk taking capability is one of the best, most life-giving talents of this congregation. It is the main reason we thrive today. Some of the risks we are going to be called to take in the near future are going to be structural. We need to try different staffing configurations, both for volunteers and for professional staff. Like other congregations, we struggle to find people to fill the church leadership roles, though we have plenty of people who will show up for one-time volunteer opportunities. How do we adjust to this new reality? How do we adjust to the reality that we are a 200 member congregation that wants the level of programming of a 500 member congregation? Are we able to continue offering all that we do? Do we have to cut back on some things in order for other areas to thrive? And what about funding? We are not, in any way, a poor congregation. Not only do we have an endowment, we have zero debt and no mortgage to pay. But still we are struggling. How do we look for outside streams of revenue? This is something congregations are not used to doing – they have always depended on being supported by the membership. But in these changing times, we need to look beyond the congregation, too. So some of the risks will be structural in nature. Other risks we are called to take together are going to be spiritual. How do we care for one another? What does it mean to be radically inclusive? What does it mean to be a force for good in Kentuckiana? How can we grow Unitarian Universalism beyond our walls? How do we adapt to a changing religious landscape that is around us? Indeed, these are the very questions our long range planning team is having us begin to address. This is last question, about the changing religious landscape, is where my passion lies these days. It centers around the sustainability of liberal religious institutions. And I have some plans I am excited about. To help learn more in this area, I have decided to continue my education. This fall, I will begin studying online at Indiana University for a masters degree in public administration – sort of like a business degree for nonprofits. I believe that congregations have much to learn from the nonprofit world as we move into this changing religious landscape. This means I will soon be coming to you with even more ideas. Lots of probably wild and crazy ideas. I hope that this congregation can be my laboratory, where we take traditional church structure and blend it with nonprofit best practices and try new things. In this way, we’ll not only be ensuring our own survival and sustainability but what we learn will be of benefit to other congregations. And in the meantime, of course, we will continue with all the OTHER good stuff that is going on. The stuff that is life-giving and life-saving. The stuff that makes this a church and not just a justice-minded social club. Since I’ll be in school, I am hoping that you will be able to utilize some of the skills you learned to care for one another during my sabbatical. We will be able to support each other, as we continue to grow together, and create one another as great congregation and effective, dedicated minister. Growing up, I remember reading Dear Abby. Whenever forlorn partners would write to her, she would inevitably ask them if they are better off with, or without, their partner. Though we have had our ups and downs, without a doubt, I am better serving you than I would be elsewhere. And, truly, I think you are better off with me than you would be with another minister. We have created one another, great congregation and effective, dedicated minister, and what we have created is a wonder to behold. It has been quite an amazing seven years of knowing you and of ministering to you. I look forward to what the next years will bring together. the place which may seem like the end may also be only the beginning. Today, we’re going to do a bit of time travel. But I don’t have a hot-tub, or a delorean. Nor do I have either a tardis or a phone booth. Instead, we are going to have to use our imaginations. We are going to go back 30 years. Right here, on this very corner of 4th and York. So close your eyes, let me do some magic. Hoogade boogade, hokus pocus. And now open them up. So, here we are standing outside the church, in 1985. Wait, what? That’s not 1985! I think we overshot it by about 50 years! Okay, close your eyes again, and let’s try again. Hoogade boogade, hokus pocus. Ok, close enough. So here we are, standing on the balcony of the 800 building across the street, looking down at First U. 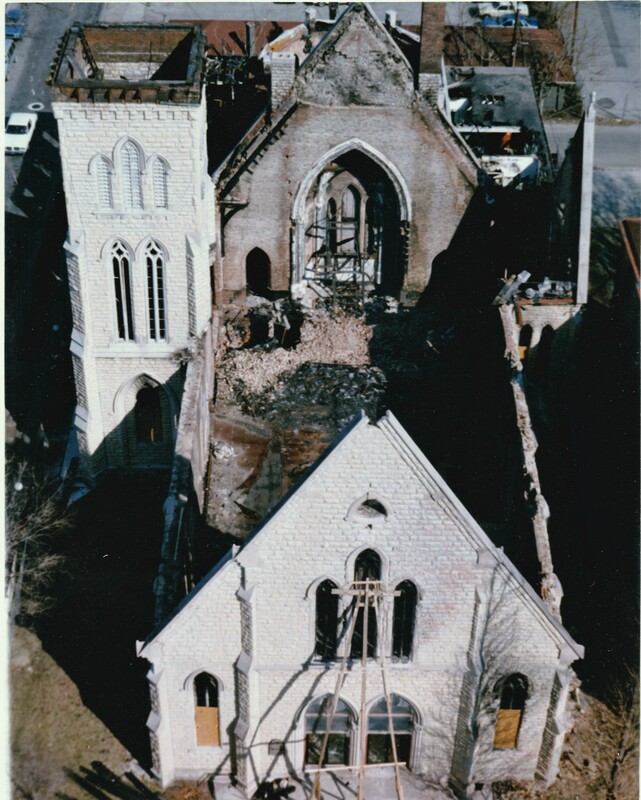 As you can see, the old steeple is still in place, and the old peaked roof. Where our church library is now, in 1985 there green space between the church and Heywood House. If we go inside the church, we will see it looks a bit different, too. 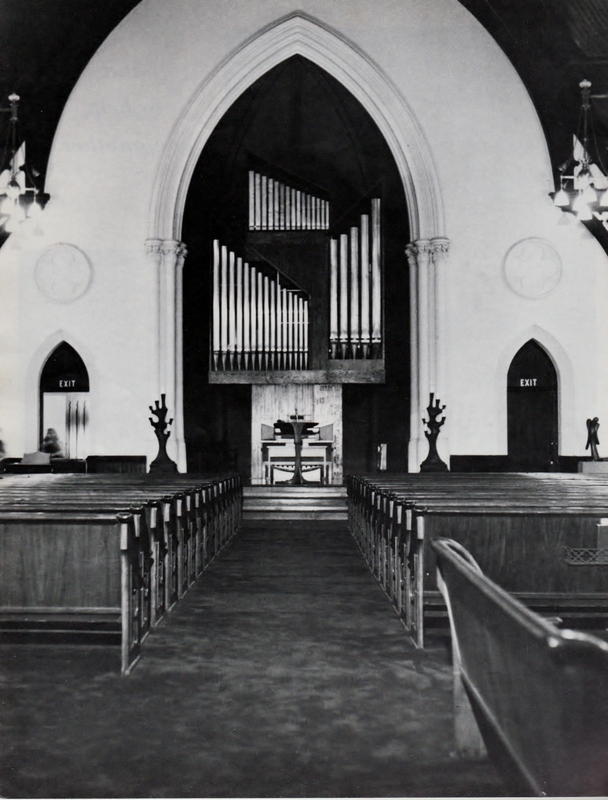 This is what our sanctuary looked like in 1985. You can see that it is lovely – old, dark wood, lovingly oiled and polished since 1872. We faced a different direction then – those windows on your left were the main doors, and the pews faced east, towards what is now the courtyard. The bay window area in our social hall is where the chancel, or stage area, was, with the pulpit, and an amazing organ that was only about 15 years old. The sanctuary was very different. And the church was different, too. Rev. Bob Reed, the beloved minister who had served the congregation for 17 years, had left just a few months earlier, and the congregation was in search for a new minister. The interim minister was the Rev. Virginia Knowles, the first woman minister to serve the congregation. Anne Miller was 17 years into the 23 years of service she gave as First Unitarian’s Director of Religious Education. Penny Nader was president of the board. The congregation had about 300 members, about 50% more than our membership today. December 13, 1985, exactly 30 years ago, was a Friday. The weather was a bit cooler than average for December in Louisville, with the high in the upper 30s and the lows in the low 20s. That Friday night, there was a pizza party for the church youth. They were here, eating pizza, having fun and fellowship. Carol and John Findling were the chaperones. As the evening wore on, the temperature outside continued to drop. A cold front was moving in. But the church was toasty and warm – Carol even remembers thinking that it was a bit too warm. The boiler had been acting up but a technician was scheduled to come the next week to service it, and there was nothing else that could be done. As the pizza party wrapped up, Carol and John locked up the church and headed home. Temperatures continue to drop – almost to the single digits. And then, something happened. We still don’t know exactly what, though suspicions fall on that pesky boiler. The fire department got the first call at 3:27am, and the second alarm followed 14 minutes later. First Unitarian Church, at 4th and York, was on fire. It wasn’t long before between 65-75 firefighters and 15 pieces of fire apparatus were on site, trying to contain the blaze. A wall collapsed on one firefighter, David Miracle, and he was taken to the hospital with severe injuries and burns. 2 other firefighters were sent to the hospital but soon released. 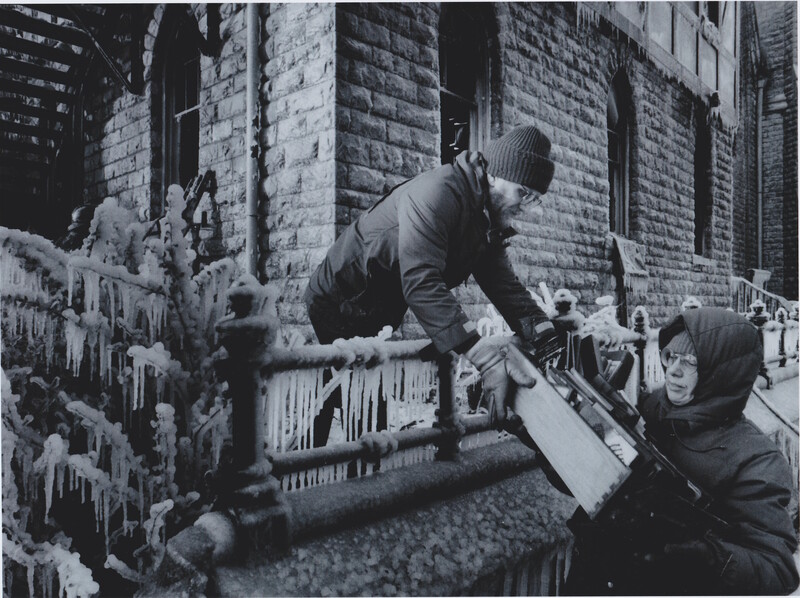 Many others suffered injuries sustained from the combination of water and 12 degree temperatures outside. As it became more and more clear that the church would be a total loss, firefighters worked to make sure it didn’t spread. There were watchers in nearby buildings and up on ladders, making sure sparks didn’t ignite the roofs of other nearby buildings. The church sexton and his family, who lived in Heywood House (which is where the parlor, church offices, and some of the RE classes are today), were evacuated along with their cats. Firefighters continued to hose down Heywood House, and miraculously it didn’t catch fire. As the sun rose, the scene was one of devastation. Breaux hall, the social hall that was where the courtyard is now, was gone. The RE classrooms were gone. The sanctuary was gone. 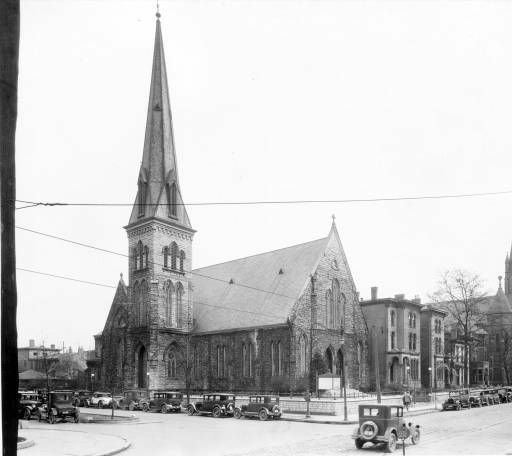 For 114 years, the church had stood at 4th and York. And now it was gone. All that remained were the stone walls. Arrangements were quickly made for the congregation to worship at Spalding, just a few doors down, on Sunday morning. The planned service was scrapped, and Rev. Knowles instead provided space for people to mourn – it was a service not at all unlike a memorial service. And just as quickly, Calvary Episcopal across the parking lot, offered their church for our Christmas Eve service. All over town, and beyond, congregations who had also experienced fires reached out to First Unitarian and shared what they could. 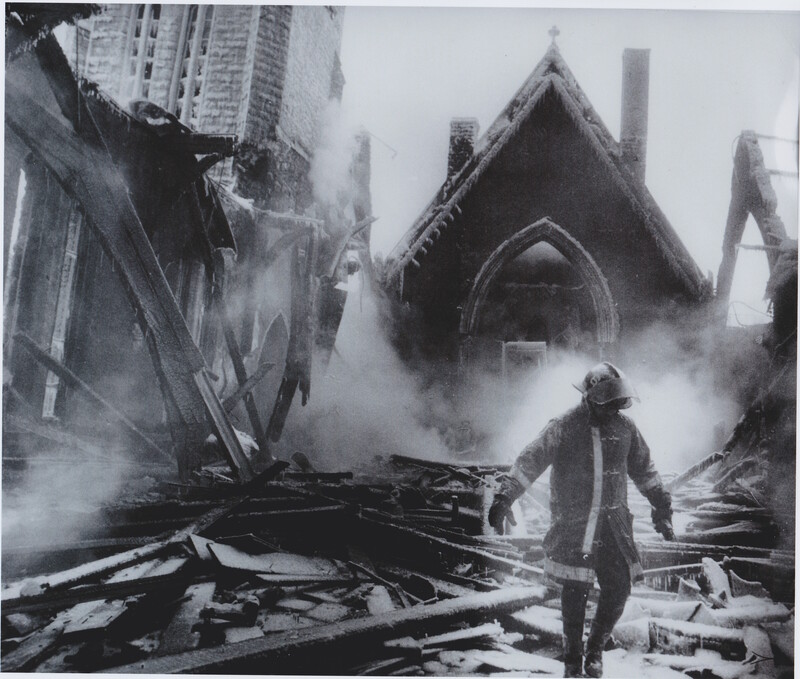 In the days that followed, firefighters braced the walls so that they wouldn’t fall in the road or on passers-by.The burned steeple was removed. 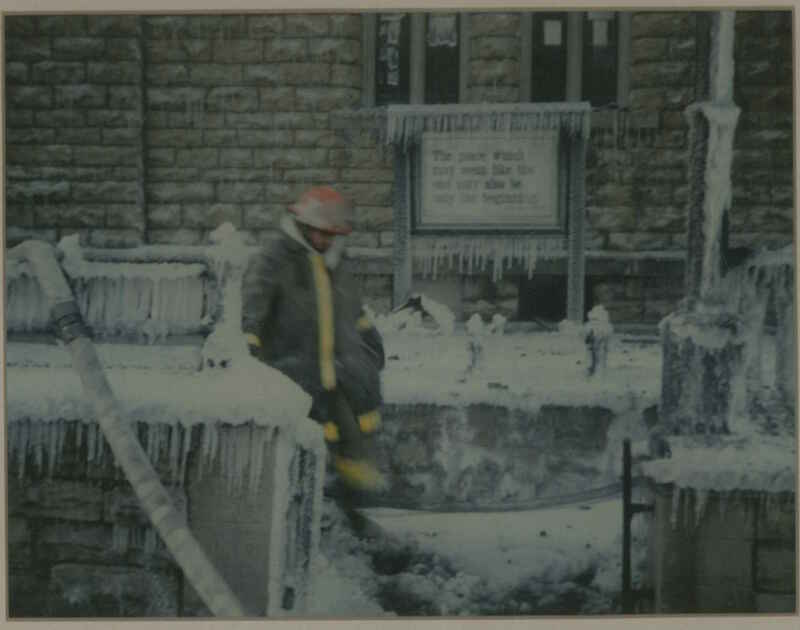 In the bitter cold, congregants salvaged what they could from the rubble. Some books, some music, but there was not much that could be saved. Reporters asked Penny Nader and Rev. Knowles: What would the congregation do? Would it stay downtown? Would it rebuild elsewhere? Almost immediately, the congregation decided to rebuild in place. 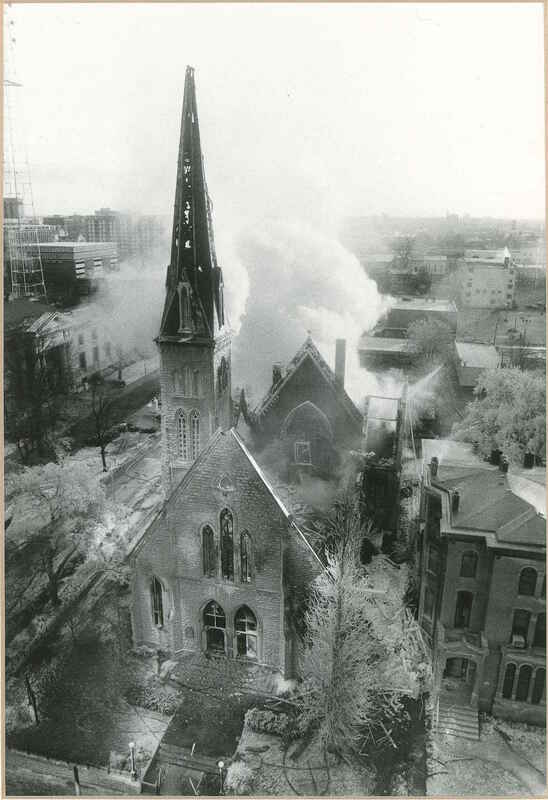 Insurance would cover much of the rebuilding, and the identity as a downtown congregation was the heart and soul of the church – they had already planted a church in the suburbs. They would stay downtown. Some were concerned about what the fire would mean for the congregation’s search for a new minister. Richard Beale, a minister in Maine who was looking for a new congregation to serve, found exactly the challenge he was looking for in this fire. 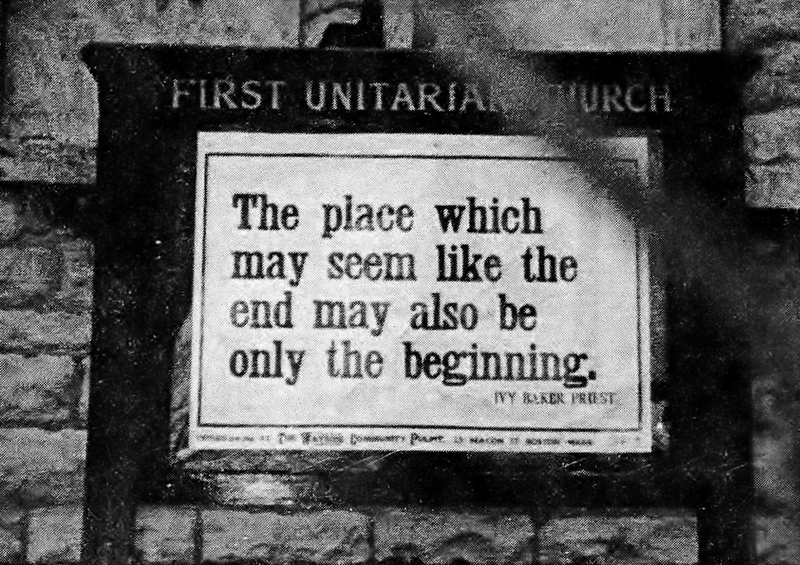 He, too, understood the wisdom of the wayside pulpit quote. In the years that followed, the congregation went through a lot. They met at different places: Spalding, and Plymouth Congregational Church, West End Congregational Church and elsewhere. They brought in experts to design the new building – a building that would be featured locally and beyond for its architectural blending of old and new – a building built with the original walls. For some, this time of transition was too much, and they left the church. But others stayed. And those who stayed were brought together. They had to choose to stay, and in making that commitment, dedicated themselves to the future of the congregation. The first service in the new building, in the building we are in now, was held on March 26, 1989. Easter Sunday. We’ll have to wait three and a quarter years for part 2 of this sermon, which will be the story of the new building and where we have gone since then. 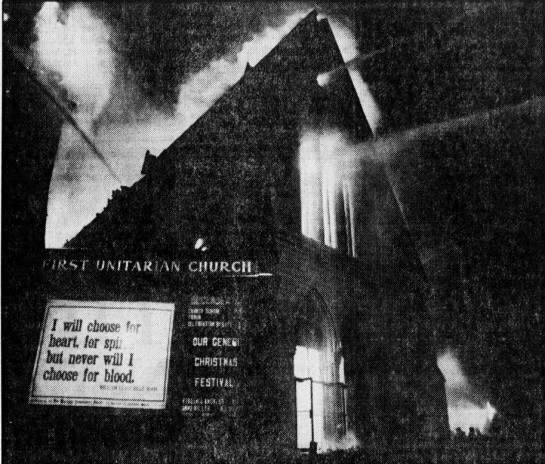 First Unitarian Church burned, but like a phoenix (an icon that would continue to inspire) it rose again out of the ashes. The devastation that at first may have seemed like an end, truly became a beginning. And we continue to live this legacy today. In just a few moments, I will open the floor for reflections from those of you who were there. What do you remember most about the old church? And what did the fire mean to you? But before that sharing, let us return to December 13, 2015. Close your eyes…Hocus Pocus. Ahh, it is good to be back in 2015. Thank you for time traveling with me today. I can only imagine what it might have been like on that night 30 years ago, and in the days, weeks and months that followed. But I know many of you were there. I invite you now to tell your story about the fire and it’s aftermath. How was the fire an ending for you? And how was it also a beginning? Thank you for sharing your stories. I invite everyone to celebrate these stories, and perhaps continue the conversation, over cake during coffee hour. And as you leave, think about how long these walls have stood here on this corner, and what they have endured, and what stories they might tell were they able. 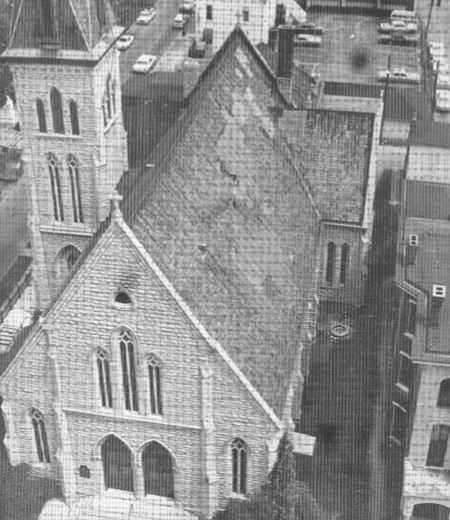 First Unitarian Church has been living it’s mission in downtown Louisville since 1830, and right here at 4th and York since 1870. And we have been worshipping in this uplifting, light-filled, beautiful space since 1989. This congregation has suffered fire, flood and homelessness, but it never lost its identity as an urban church. May this history and this identity continue to inform us today. And whenever we may find ourselves at an impasse, may we be heartened by the knowledge that what at first might seem like an end, may really and truly be just the beginning. When I received an academic scholarship in my second year of seminary, I was pleasantly surprised. Though I had done well the first two semesters, those more recent grades stood in stark contrast to my undergraduate career. Reviewing my college transcript recently, I saw how I had started my freshman and sophomore years with a few As, but mostly Bs and Cs. And by my senior year, I had pulled my grades up to almost entirely As. But my junior year? That stood out as pretty dismal – a few Cs, mostly Ds and a couple of Fs. Ahh yes, my junior year of college. It started off with the death of my grandmother. And then a dear friend who was like a sister to me was diagnosed with colon cancer. Someone quite close to me attempted suicide. The long-term relationship I was in crashed and burned magnificently. A friend of my younger brother killed himself accidentally. And someone else quite close to me ended up hospitalized. That was the fall semester. I remember going to my professors, crying in their offices, begging for extensions (to this day, I remember the ones that were kind to me – kindness matters.) I couldn’t focus, couldn’t concentrate. I could barely do anything without breaking into tears – much more than I even do now. I coped by staying up late with a close group of friends, going through cheap bottles of wine much too quickly. Not exactly the healthiest of coping techniques. I hope and pray that that fall of 1991 will always hold the record for the number of losses I experience in a short amount of time. Even that spring, I struggled to keep up. When my parents threatened to remove me from college, that was one more loss I just could not allow, and I managed to pull myself together just enough to eek by. Fast forward just six months later, and you wouldn’t recognize me. Acing the computer science courses I had failed just a year earlier, and then falling in love with the first anthropology course I took and lamenting that senior year was too late to change my major. By my senior year, I aced all my classes except that one darn racquetball course. So close! What caused such a turn around? I couldn’t have expressed it at the time, but in retrospect, I see that a large part of the change was due to processing my grief. Grieving all these losses brought me into relationship with my core self. It stripped away all the layers of strength and protection I had carefully built up. And it brought me into relationship with the world – it made me feel a part of something larger. That was one reasons why I became so drawn to anthropology that last year: I became acutely aware of my place in the world, and the lives and suffering not just of myself but of those around me. This same awareness, which was just germinating in that horrible year, would eventually lead me to seminary, and ministry. Though I never would have labeled it as such at the time, I can look back and see that that fall of 1991 was, at it’s core, a spiritual experience for me. In order to understand the connection between grief and spirituality, let’s do a bit of “grieving 101”. Whether we are grieving the loss of a loved one, the loss of a future we had come to look forward to, the loss of a job, the loss of health, the loss of prestige or influence – when we lose something or someone we care about, we grieve its loss. When I do memorial services, I do a brief primer on grief in the service. I find it’s helpful to remind us of three things about grief: first, I say that there is no one right way to grieve. Each of us finds our own way. The work of grief is to honor what we’ve lost. And grief doesn’t really go away. This is the second thing I share. Grief isn’t something people get over. Instead, time teaches us to weave each loss into the fabric of our lives. And as we do, we can become stronger, more compassionate and more loving as a result of the loss. In time we hopefully will come to some new sense of peace. And finally, I tell people that when we lose some thing or someone that we love, it also brings back every other loss we’ve ever suffered. Our grief becomes compounded. Applying this to my semester of hell, I can see the growth in myself – in time, I did come to a new sense of peace. But it never went away, as evidenced by my tears these 20+ years later. And I was never the same person again. I had suffered, and I grew a deeper compassion, and sense of gravitas, as a result. I can feel that younger me, confused and confounded, even when I experience grief today – I feel her less as the number of losses I grieve becomes larger each year, but I feel her there. Notice how I don’t address Elisabeth Kübler-Ross’s five stages of grief in what I say in memorial services. In her book On Death and Dying, originally published in 1969, Kübler-Ross found that there was not much research into the emotional experience of dying, and so she took the stories of terminally ill patients and brought them to the public in her best selling book. Kübler-Ross posits 5 stages of grief: Denial, Anger, Bargaining, Depression and Acceptance. Though she never intended these to be understood as a linear progression, the public co-opted them as such, and so people would ask questions like “What stage in the grieving process are you? Are you at Acceptance yet? I’m still stuck in Bargaining…” Additionally, the book was neither a scientific study, nor was it a study of grief in general. It was simply a discussion of some of the major emotional reactions people have to the experience of dying. Yes, grief can be a part of that experience, but death is not the totality of grief. So while Kübler-Ross gave us some language to begin to discuss grief, she is neither the final, nor the only word. Another model for understanding grief is proposed by psychotherapist David Richo, in his 2008 book When the Past Is Present. He posits that grief is composed of three feelings: sadness that something was lost, anger that it was taken away, and fear that it will never be replaced. While he has much that is useful to say, I feel these three feelings are an oversimplification of grief, and don’t explain the wild and crazy emotional roller-coaster that grief can be. My current favorite reading about grief is by my friend and colleague the Rev. Mark Belletini. Mark just completed his thirty-seventh and final year in parish ministry. He retired from First Unitarian Universalist Church of Columbus, Ohio, where he served for seventeen years. He previously served two congregations in California, and was chair of the commission that produced our grey hymnal. Rev. Belletini was one of the first openly gay Unitarian Universalist ministers, and he served congregations in the San Francisco area, during the 80s and 90s – the height of the AIDS epidemic. He recounts going to multiple funerals for friends each week, and what that loss did to him. In his book Nothing Gold Can Stay, he uses his own expediences as a lens through which to look the many varied forms of grief. Mark writes, that grief, he has come to see, “is not a single feeling in and of itself but a whole symphony of feelings, some seemingly deeply dissonant from each other.” For example, grief can include sorrow, and it can also include joy. We may feel sad at the loss of a loved one, and joy when we remember the love we shared with them. Grief can include guilt, and it can also include gratitude. We may feel like we should have spent more time with someone who we have lost, and at the same time feel gratitude for what they brought to our lives. Grief can include anger, and also relief. We may be angry that something we cared about was taken from us, or angry at ourselves for not acting the way we wish we would have. And at the same time we may feel relief that a difficult relationship or job has been terminated, or that a loved one’s suffering has ended. It isn’t anything to fear, although it certainly can be confusing and disruptive…This cocoon creates a delicate but real spaciousness separated from the demands and duties and worries and relentless schedules of modern-day life. It takes room to grieve, room that our frantic, confusing, and narcissistic modern world refuses to notice or offer. Another colleague of mine the Rev. Gary James, writes about the importance of this kind of cocooning as “the winter of the heart.” He says, “In the winter of the heart one is invited to discover a faith that grapples with pain and uncertainty; grapples with evil, loss, and the mystery of death, and in so doing, discovers hope and a deep joy on the winter-fallow landscape.” Though it is not always possible, and though we often don’t realize it at the time, grieving can give us entry into this winter of the heart and allow us to emerge with a deeper faith. Our grieving, as painful as it can be, can teach us about who we are, and about our connection to one another. As Francis Weller writes, “The gift of grief is an affirmation of life, and of our intimacy with the world.” In this way, grief is something that, well lived, can help us discover our purpose, our reason for being, as Daniel the Leaf put it in our moment for all ages this morning. When we are able to embrace our grief, to make room for it in our lives, grief can connect us to the larger world. Because all of us have grieved, have suffered loss. The first of the four noble truths of Buddhism says that all of life is suffering. That everyone hurts. We bereaved are not alone. We belong to the largest company in all the world- the company of those who have known suffering. When it seems that our sorrow is too great to be borne, let us think of the great family of the heavy-hearted into which our grief has given us entrance, and inevitably, we will feel about us their arms, their sympathy, their understanding. Would I have understood any of this when I was in the midst of that deep, heavy grief my junior year of college? No. Do I think about it when I experience loss now? Sometimes. Not always. But sometimes, when I am grieving and feel more vulnerable than usual, when I seem to laugh for no reason or cry whenever someone says or does something kind, I do reflect on those words of Helen Keller, and on the wisdom of my friend Mark Belletini. When it seems that my sorrow is too great to be borne, I sometimes feel my connection to the world, and to that great family of the heavy-hearted into which my grief has given me entrance. And I do, inevitably, feel about me their arms, their sympathy, their understanding. And what a gift this is. What a blessing. When you find yourself in the midst of grief, and I can say with assurance that you will one day if you haven’t already, may you find such comfort and may it give you a glimpse of hope and bring you peace. For to grieve is to love and to love is to give praise and thanksgiving for the life which has blessed us all. May it be so. Blessed be. O why should the spirit of mortal be proud? Meet the changes they met on their pilgrimage road. Summer has faded, now, and we can feel the coming of Winter. Nights have grown longer, the time has changed, the ground has frosted, the leaves are falling. Last night, our children played with death and fear. Pagans celebrated Samhain, the thinning of the veil between the living and the dead. Today, our Hispanic neighbors celebrate the Day of the Dead. Today and tomorrow, Christians are marking All Saints and All Souls days, both holidays commemorating the dead. This is the time of year we pay attention to death and to dying. A time to be hyper-aware of our mortality. Death, we know, comes to us all. But it comes to us all in different times, and in different ways. For some, it will come after a long life well-lived. Others will die much too soon. Some of us will go quickly, and others will experience prolonged suffering. Some will have warning, some will have what feels like too much warning, and for others of us, no amount of warning will be enough. Some of us, indeed, are already in this place of contemplation – know that either due to age, or disease, death is knocking. In between is our lives – the story of our lives. With heroes and villains, ups and downs, plot twists, and more. Forrest Church said that the main task of religion is to figure out how to live knowing that we will die. We live our lives making meaning, finding the way to live our stories. What we sometimes forget is that how our story ends matters, too – it matters to us, and it matters to those who are left behind. It’s difficult when the end of our lives doesn’t match up with what we hoped the end might be like. It is hard for us, and it is also hard for our loved ones. There is a higher case of depression in our loved ones if, when our times comes to die, we don’t have the death we hoped for – if our loved ones question whether they made the right decisions, the ones we would have communicated to them if we could have. Gawande is an American surgeon, author, and public health researcher. Wikipedia says that he is a general and endocrine surgeon at Brigham and Women’s Hospital, professor in both the Department of Health Policy and Management at the Harvard School of Public Health and the Department of Surgery at Harvard Medical School. And he is a staff writer for The New Yorker. He believes “we have the opportunity to refashion our institutions, our culture, and our conversations in ways that transform the possibilities for the last chapters of everyone’s lives.” Gawande’s recent book, Being Mortal, can be a part of that refashioning process. These conversations often start with technical details: who do you want to make decisions for you when you no longer can? What sort of medical treatments do you want, or not want? How comfortable do you want to be? But the conversations don’t stop there. Ideally, the types of conversations we have with our loved ones will include talking about our priorities, knowing, of course, that these priorities will likely change over time as we change. Gawande talks about a patient of his, who evaluated whether or not to have surgery based on whether it would allow him to eat ice-cream and watch football. Those were his goals. If the surgery would allow him to do that, then he would go ahead with it, but if not, he was content to continue the course he was on. Until he was unable to eat ice-cream and watch football, he said no to the surgery. When he no longer was able to do so, he agreed to the surgery since it would give him back these capabilities – otherwise, he would not have had it done. Part of the problem is that medical advances have outpaced our ability to adapt. When there is no way of no how much longer we have, and particularly when we imagine ourselves as having much more time than we actually do, then “our every impulse is to fight, to die with chemo in our veins or a tube in our throats or fresh sutures in our flesh.” Gawande says “The fact that we may be shortening or worsening the time we have left hardly seems to register. We imagine that we can wait until the doctors tell us that there is nothing more they can do. But rarely is there nothing more that doctors can do.” There is always one more thing to try. Instead of reducing aggressive treatment options for their terminally ill policyholders, [Aetna] decided to try increasing hospice options. Aetna had noted that only a minority of patients ever halted efforts at curative treatment and enrolled in hospice. Even when they did, it was usually not until the very end. So the company decided to experiment: policyholders with a life expectancy of less than a year were allowed to receive hospice services without having to forgo other treatments…A two-year study of this “concurrent care” program found that enrolled patients were much more likely to use hospice: the figure leaped from 26 percent to 70 percent. That was no surprise, since they weren’t forced to give up anything. The surprising result was that they did give up things. They visited the emergency room half as often as the control patients did. Their use of hospitals and ICUs dropped by more than two-thirds. In addition, these patients often lived longer than expected, with a better quality of life. When we communicate our priorities with our doctors and with our loved ones, our end days are more likely to match up with the rest of our stories. We are more likely to die in the way we want, which is good for our well being and for that of our families. As a person with aging parents, I found the book to be very educational on how to approach my parents and in-laws as their health inevitably begins to fade. But it also made me realize that I need to have more conversations about my own wishes and priorities with my spouse. Though we have wills and advanced directives already filled out, I anticipate an enlightening conversation about priorities – about how the interventions we would want are very much based on how we would be able to interact with one another, our children, and our families. Let’s hear from two other people who have found Being Mortal to have been formative in their own processes. First, Vida Vaughn is Assistant Director of the Kornhauser Health Science Library at the University of Louisville. Then we will hear from our own Rita, and her experience of the book. I have been in many meetings where doctors have wrestled about what their approach should be when counseling patients on difficult choices. Should they tell the patient what they think is best for them with expectations of compliance? The paternalistic approach. Should they be a source of facts and figures but remain detached from influencing the patient’s choices? The informative approach. Or should they act as counselors and contractors, guiding the patient with information and questions that help the patient determine what is best for them? The shared decision making approach. While medical literature generally promotes the shared-decision making approach it is not without its own challenges. Rarely in the emotionally charged circumstances of aging or death is a doctor interacting exclusively with a patient. The physicians I work with regularly discuss the trials of addressing the desires of family members…especially when those desires contradict that of the patient’s. There are times when the doctor feels confident a plan of action only to have that plan dissolve as a result of second thoughts the patient may be having. My heart has truly gone out to these young men and women as I have listened to their well-intentioned efforts to do what is best for their patients as they navigate the minefield of sorrows, fears, lost dreams, and the non-absolute science of medicine. The only true absolute being that all of us will die at some point. It was because of my experience with physicians that I felt compelled to share Dr Gawande’s book Being Mortal with some of the physicians I work with. I gave it to the head of the internal medicine residency program with hopes this book would become part of the curriculum. I also shared it with one of my extremely bright residency chiefs upon his graduation with the counsel that part of being a great clinician is the ability to have the hard conversations that go beyond the science of medicine. As my parents (ages 92 and 91) started needing help, one of my 5 brothers sent a copy of Being Mortal to each of his siblings. My brother is a doctor and had met Dr. Gawande at a conference and was impressed with his insight and earnestness. My folks have been in the same 3 story house for almost 60 years. My father plans to die there and my mother regrets that they didn’t move to a manageable space decades ago. Dad spends his days confined to 4 rooms and has no interests outside of watching TV. He loves playing cards, but being mostly deaf and becoming more confused has robbed him of the ability to participate often in this simple pleasure. Some days are better than others. Mother yearns for community connections and human contact. She has become Dad’s caregiver and there is little communication between them beyond his physical needs. As the only ‘in town’ daughter I am relied upon to do a lot of the weekly support for my folks. This assistance ranges from the simple, “Here Mom, let me take you to the grocery” to the more intricate assessment of what they really want and communicating that to my siblings without adding what I think they “need” to be safe or even comfortable. I have learned that I can do little to address their deepest fears, but can listen to them. In my job, I resource over 200 people, many of whom are in their 70’s 80’s and 90’s. The range of physical, emotional and psychological health and mental acuity is astounding. I know that physical comfort can top safety as a priority, that recognizing who is talking to you isn’t as important as being talked with. I’ve learned that we do not “enter a second childhood” as we age, but we may enter a different way of dealing with our world. One of the biggest lessons I’ve learned is that there are as many people afraid of dying as people who are afraid of living too long and that we need to respect each fear. This book has helped me understand that we (our generation and Americans) are really bad at aging, becoming aged ourselves and dealing with aged people. Part of this is because we no longer live in multi-generational homes where our elders die at home. Americans are independent by nature, seeking our own happiness, security and paths to success. We no longer inherit the family farm and grandma with it. We move out of town and establish lives elsewhere. Another factor is our youth/beauty obsessed culture that has negated respect for elders. This change has left a void in how we view the aging process. The fact that we view aging as an illness and that dying is done behind a hospital door, often with only medical staff in attendance, makes it hard to see nobility in the elderly. I hope to apply these lessons to my own aging process and go out on a high note without exhausting my resources, family or friends. Conversations with our loved ones and medical providers about our priorities as we approach death or as we age not only help us to have confidence that our wishes are understood, but they help our loved ones in their decision making – giving them confidence that they are doing what we would want. Embracing Mortality, by Atul Gawande, raises some helpful questions about how to have these sacred conversations. But you don’t have to read the book to get started embracing your own mortality. On Saturday, November 21, from 10am – 12pm, here at First U, we will help you take a step in that direction. On that day, we will have social workers from Hosparus here with advance directive forms, living wills, and more – not only will they be able to answer your questions, they will be able to notarize the forms to validate them. We will also have the forms required in case you want to donate your body to the University of Louisville medical school, and possibly a lawyer who can talk to you about to when to consider guardianship issues. This is not just for the retired or elderly – parents of young children, we will be providing childcare because we know that it important that you have these conversations as well. Oftentimes, those of us younger than a certain age forget that disease or terminal illness can strike at any time. Having had these conversations in advance of such a diagnosis can give us peace of mind in case something happens to us or to a loved one. Death comes for all of us no matter how busy we are, how important we are, how much we run away from it. It is an essential part of our stories. Recognizing and embracing our mortality means understanding this, and having conversations with our loved ones about the type of death we want, about what our hopes are as we approach death. In this way, understanding the finitude of one’s time can become a gift that we give ourselves, and our loved ones. It is, truly, a religious act in that it is a final way of making meaning. May we treat it as such. May we make room in our lives for these sacred conversations. Because to be human means to be mortal, and to be mortal means to die. Because of all of this, let us speak of those priorities we have, those desires and passions beyond merely being safe and living longer, so that we might have the chance to shape our story and thus find meaning in our lives. Turning on the TV the other day, my mood went from pleasant to grumpy to depressed in a five minute span. The show I’d turned on featured a family doing some amazing and fun activity together. This triggered my guilt that our favorite family past-time tends to be watching movies together – not very extraordinary. Then came a commercial break: first a commercial for a plastic surgeon, then a commercial for a drug that will make sure men are ready for whatever, um, adventure, comes their way, then a tutoring service to help kids get better grades, then a new diet guaranteed to lose that belly fat. At the end of 5 minutes, viewers received the message that they aren’t enough in many different ways: not extraordinary enough, not pretty enough, not virile enough, not smart enough, not thin enough. Watching through the next commercial break, the messages continued: my hair isn’t shiny enough, my car is too old, my pores are too big. Not to mention the lead story in the local news about a 10 year old picked up by the cops for walking to a playground 3 blocks from home, because heaven knows we are not safe enough. Everywhere we turn, we get the message that we are not enough. Usually, this message is followed with a remedy: buy this product and it will make you better. But it doesn’t make you better, because there is always another way you are found to be lacking. It takes a tole on our self-esteem. And it’s not just companies shilling their products that takes a tole on our sense of self-worth. Studies have shown that one in three respondents felt more dissatisfied with their own lives after spending time on facebook. This is because facebook represents what we want the world to see of us – our best, or even imaginary, selves. But when we read other people’s status, we read them like the blind man who felt an elephants leg and decided it was a tree – we don’t get the whole picture, and so we envy other people and fear we are missing out on life when our real life doesn’t compare to someone’s facebook life. When we are told we are not enough, we often feel a sense of shame. We feel that intensely painful feeling that we are flawed and that therefore we are unworthy of acceptance and belonging. We are unworthy because we can never be good enough, perfect enough, thin enough, powerful enough, successful enough, smart enough, certain enough, safe enough, extraordinary enough. Brené Brown, a shame and vulnerability researcher, says that “most of us, if not all, have built significant parts of our lives around shame. Individuals, families and communities use shame as a tool to change others and to protect themselves. In doing this, we create a society that fails to recognize how much damage shame does to our spirit and the soul of our families and communities.” Shame tells us that we are not enough and that therefore we are unworthy of love and acceptance. Our ministry theme for this month is compassion. Part of being compassionate, indeed perhaps the starting point, is to have compassion for ourselves. This requires confronting the shame we feel and providing an antidote. And it is particularly fitting to provide an antidote to shame in this, a religious institution, because much of our cultural tendency towards shame originates, I believe, in religion – one particular religious viewpoint that was adopted hundreds of years ago. I am talking about the theologian Augustine, and his interpretation of how Adam and Eve were cast from the Garden of Eden in the book of Genesis. For those you unfamiliar with this story, it is part of the creation story shared by Jewish, Christian and Muslim people: God created everything, and it was good. God put Adam and Eve in the Garden of Eden, a paradise, and gave them one rule: don’t eat from this one tree. Long story short, they did. And they lost their innocence, and were cast out from paradise. Augustine was an early Christian theologian, writing around the year 400. It was his view on original sin that became church doctrine. He thought that passion interfered with Adam and Eve’s willpower, it made them prideful and foolish, and so they sinned against God and ate from the tree. But this act, this very first, original sin, was not confined to Adam and Eve. 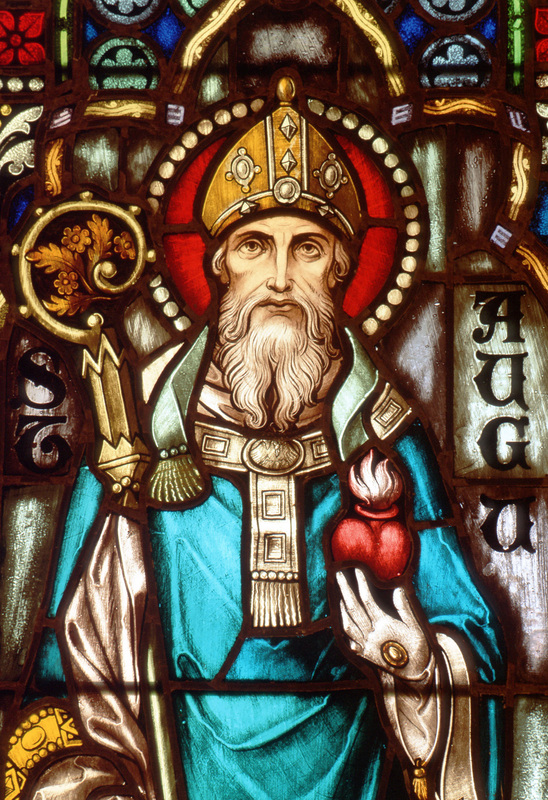 Augustine said it is instead passed down to all human beings and that it is this original sin that separates us from God and makes us doomed to eternity in hell. One of our greatest fears is of being loved and then having that love taken away. It is devastating because it can…reaffirm those voices in our heads that tell us that we are not good enough, that we don’t deserve it, that we are always messing things up. Unfortunately, this has also happened culturally to us with the sacred relationship. The primary story for half of the world’s people…is of Adam, Eve and God. And within just a few paragraphs of the story’s opening pages, humans have disappointed God so greatly we are thrown out of paradise and it is forever hidden from us henceforth. We made a mistake and God cannot or will not forgive us and the rest of the story is about us trying to show that we love God but are never really good enough. No matter how many times we replay the story, we human beings are never really good enough, we always fall short. And we always get kicked out of the garden. We are separated from God, from the divine, from love, and as Hafiz wrote in our opening words, this is the hardest work in this world. It is excruciatingly painful because we humans are hardwired for connection – connection with one another, with the divine, with love. Connection, Brené Brown says, is why we are here – it gives purpose and meaning to our lives, and without it there is suffering. Our shame keeps us disconnected. But what if we turn that story around. What if the ancestors got it wrong? Theologian Matthew Fox denies the doctrine of original sin, and instead writes of original blessing. He says that we are born into love. Instead of focusing on being cast out from paradise, he looks at the preceding verses. First, God created heaven and earth. And it was good. And then God created day and night. And that was good too! And then God created the sky, and the earth, and the waters, and the plants, and the animals, and the people. And after each thing God created, God declared it good. Fox’s theology resonates with historical Universalist theology, which focused on a benevolent God who would offer universal salvation to all – that no sin, original or not, was too great to separate us from the divine. Original sin tells us we are dirty, shameful creatures, unfit to be in the presence of the divine. Original blessing tells us that we are good, we are lovable and we are enough. Or, as Julian of Norwich would say, that all will be well. So how do we improve our level of self-acceptance? Brown outlines 10 guideposts in her book. One she mentions frequently is through practicing vulnerability. When we allow ourselves to be vulnerable with one another, we strengthen our connection to our own worthiness and to each other. Brown says “Vulnerability is the birthplace of love, belonging, joy, courage, empathy, and creativity. It is the source of hope, empathy, accountability, and authenticity. If we want greater clarity in our purpose or deeper and more meaningful spiritual lives, vulnerability is the path.” The path to wholeheartedness. And so I’m going to ask you to be vulnerable with me, and with one another for a moment. I would like to pass around a blessing. I’ll start each seating section off, and then one at a time you will pass the blessing around, much like we would play the game of telephone, until each of us has blessed one another. The person giving the blessing will turn to the receiver, and the giver will say “You are enough.” The receiver will then answer “I am enough.” And together you will say “Blessed be.” Then the receiver turns to their neighbor and becomes the giver, passing the blessing along. Shame tells us that we are not enough: not good enough, not perfect enough, not thin enough, not powerful enough, not successful enough, not smart enough, not certain enough, not safe enough, not extraordinary enough. But shame’s origins are in a faulty theology of original sin passed down from the generations. Isn’t it beautiful how the children took the dead bird into the woods so that they could bury it, have a funeral, sing to it and decorate and visit its grave? They cared for it so gently, so lovingly. I suspect most of us would appreciate that type of loving care when it comes our time to die. And yet, so many of us don’t talk to our friends and family about what that type of loving care might actually look like. Surveys indicate that while 60% of people say that making sure their family is not burdened by tough decisions is “extremely important” to them, a full 56% of us have not communicated our end-of-life wishes to those friends and family whom we don’t want to overburden. Death. It happens to all of us. Oh, but we’re in such denial about it! And this culture of “death denial” takes many forms. We get uncomfortable talking about our values and wishes for our death around our loved ones. I would bet that a number of you are squirming in your seats even now. Some of us superstitiously feel like talking about might make it happen sooner. We obsess about youth and looking youthful – as if young looking people are immune to death, though we know they are not. We use so many euphemisms to talk about death: we say that someone has passed, crossed over, departed, bought the farm, gone belly up, followed the light, is no longer with us. We embalm and make up the bodies of our loved ones who have died, hoping to make them look more alive, to keep us ever further away from death. It was not always this way. The 1930’s saw a medicalization of death. Prior to this time, most people died at home. Even today, 70% of people say they would prefer to die at home, but that same percentage, 70% actually die in a hospital, nursing home, or long-term care facility. Now, in order to not offend our own or our loved ones sensibilities, we don’t talk about our own death, though we sometimes seem obsessed with the deaths of others. Only 7% of people report having had an end-of-life conversation with their doctor. But what is so baffling is that we want to have these types of conversations. Maybe only 7% have actually had them, but 80% of people say that if they were seriously ill, they would want to talk to their doctor about end-of-life care. So we want to have these conversations, with our doctors, with our families, with our friends. But we don’t. We don’t because, well, because they are difficult conversations to have! We’ve spent most of our lives pretending as though we would never die, so to have a conversation means that we have to acknowledge this reality, if only for a moment. And that can be scary. I had many end of life conversations with my mother and they made me feel like her passing and death was complete. Nothing was left unsaid. I grew up with the blessing of living near all four of my grandparents. As they grew aged, they moved in with our family…[On my grandfather’s last day of life, he] had spent hours outside planting a fig tree seedling with two of his grandsons. He enjoyed his dinner and went to bed. In the middle of the night, I heard him call out from his room next to mine. I went to him and turned on a lamp. “What is it, Grandpa?” “I’m cold,” he said, with a far away look in his eyes. I roused my mother…As we spread out a blanket to warm him, our eyes met with a knowing look. I woke my father, his son, and told him to go to Grandpa, that I thought he might be dying. Startled and afraid, my father said, “Call 9-1-1!” But I sat still on the edge of the bed and thought of my grandfather’s clear message over the years. “Dad, Grandpa is 94. He has had a good, long life. He told me he is not afraid to die…This is a good way to die. At home, with all of us around him.” We called Grandpa’s other two sons and the three men circled their father’s bed as he took his final breaths. My paternal grandfather died the way so many Americans say they wish to die: at home, peacefully, with loved ones surrounding them. When my husband’s step-mother was diagnosed with brain cancer last February, we were all in crisis mode. She was confused and disoriented, and experiencing a lot of pain. Thankfully, we had engaged in conversations about end of life prior to this and my father in law felt as though he knew what her wishes were in a general sense. As steroids and chemotherapy shrunk the tumors, my mother in law regained her capacity to engage in meaningful conversation. We had many. We talked about treatment options and the potential outcomes of those treatments. We talked about what was important to her in terms of the goals she would hope to achieve in her life, and what her hopes were for her healthcare. Some days we talked about the coming months. Some days we talked about what the final days would look like. Many of these conversations were just between her and I, in quiet moments while chemotherapy drugs were dripping into her veins. Many others included her children and her husband. A few included her health care team – she was abundantly clear about certain aspects of her care and had specific wishes around intervention she would and would not be accepting of. We revisited these specific wishes with each change in her health circumstances. And when her goals for her care changed, we were sure to communicate those goals to her health care team. Now, 11 months after diagnosis, we are near those final days. She is more confused now and it’s hard to know for sure what she does and does not understand. Yet, we continue to talk. This journey has been a difficult one. There is nothing easy about watching someone you love experience pain and distress. But the conversations we have had, and the confidence that we, as a family, feel in knowing her wishes for her final days, are a gift. A gift that she gave to us by being so open and courageous in speaking about her life and her death with us. We are sad. But we are not in distress. We are facing these days with her, advocating for her, and supporting her health care team in honoring her wishes. What a gift it can be, to you and to your loved ones, to have these conversations, as uncomfortable as it may seem in the beginning. And, lest you younger folks be tuning out, these are not just conversations to have with older people, as these next stories demonstrate. August 13, 1992 was the day of all heart break for myself and husband, well the whole family, really. Our 25 year old son was injured in an accident and lived on total life support for three and a half weeks. Then the decision was made to turn it off and just wait while he died. Oh there is much of this story I could tell you, but what I want to share is that now, all these years later, I realize …I had a responsibility. It should have been that even the younger family members were included in a conversation about the “what if’s” and what would you want done. Those decisions were upon our shoulders after our child was injured. It would have made a difference if only there had been some prior input. Don’t forget the younger ones. My 28th birthday is coming up. As I inch closer to 30, my friends like to joke around that I’d better get ready to settle down. “When are you getting married? When will you buy a house? Isn’t it time for you to have children? It’s time to become an adult!” They’re kidding of course– none of those things are in the cards for me just yet. While I may not be pregnant or in escrow yet, or even close, I can relax knowing that I’ve already made some very good adult decisions. At the age of 21, I made the decision to prepare an Advanced Directive to explain my wishes in the event of a catastrophic medical event. It was an odd move for someone my age, but my friends and family weren’t terribly surprised at my unconventional decision. I became interested in the study of death and dying while getting my Sociology degree in college. During college, I took a job on the Oncology floor of a hospital. During my time there, I experienced my first patient death, and many more after that. While we could anticipate the coming death of many patients, some patients declined suddenly, leaving the patient and family unprepared when the moment arrived. As I witnessed my first “hallway conversation” with the stunned family outside of the hospital room where their loved one was being resuscitated by the Code Blue team, I saw the decisions they had to make. Reflecting later, I wondered what I would do in their shoes…I knew I never wanted my parents or boyfriend to stand in the hallway and make that choice. It wasn’t easy, but I wrote out my wishes and sent a copy to my parents and my physician. It was hard for them to see, but I know they respected my decision…My generation has questions, but it’s hard to think about your own mortality in your twenties and thirties. In this transitional stage of life where we’re busy planning the rest of our lives, I believe this is an incredibly important conversation to have. When you’re ready to have the conversation, first consider the basics. Who do you want to talk to? Who do you trust to speak for you? When would be a good time to talk? Where would you feel comfortable talking? What do you want to be sure to say? The Conversation Project even gives some suggested ways that you might begin the conversation, because those first words are often the most difficult. Or you might want to go to a Death Cafe. Over coffee or tea and some light munchies, people talk about death – what it means to them, how they want it to go, what their experiences of it are, and so much more. You can find out when they are happening locally on their website: deathcafe.com. And of course, as your minister, I am available to preside over the dying, guide a family in grief, and help you process your thoughts and wishes. We can talk alone, or with your friends or family, in whatever capacity works for you. If it is as the Rev. Forrest Church said, that “religion is our human response to the dual reality of being alive and having to die,” then it makes sense to talk to a religious professional about your thoughts, hopes, fears and beliefs about death and dying. Every one of us will die, whether we are ready or not. It relieves a burden on our minds and hearts, and in the minds and hearts of our friends and family, when we can share our values around death and dying with them – when they know that they can honor our values in our last moments. Let us not participate in this culture of denial. There is a time to be born, and a time to die – and a time to talk about the death that we want for ourselves and our loved ones. May it be so. Blessed Be.